Bargain offer reduced to £4 plus additional 25% off with code VCUK25. Plus 12.6% cashback through Topcashback. 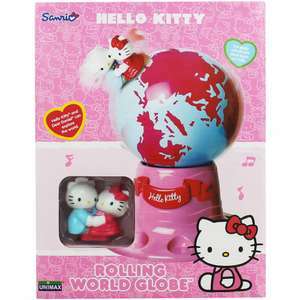 This gorgeous Hello Kitty Rolling World Globe is the perfect toy for little ones, for development and fun too. Explore the world with Hello Kitty and Dear Daniel whilst the globe rolls and plays music too!